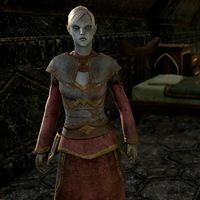 Acolyte Cadiva is a Dunmer priest found in the Grandmaster's Palace in Kragenmoor. She is tending to a dying Helgana Hroason. "Helgana will soon be with her ancestors in Sovngarde. The vile Covenant soldiers of Softloam Cavern have seen to that. May the Lord, Mother, and Wizard watch her on her journey." This page was last modified on 10 March 2019, at 02:34.